I always want to do some huge surprise project before my parents visit from St. Louis. Sometimes one gets done, sometimes not. Sometimes one gets done and I can't keep my mouth shut so they know about it but this time, I managed to keep it a secret. We've wanted a porch on the front of our house ever since we moved in. I decided 2 weeks before their visit that it was time to make it happen. There's nothing like slapping a front porch on quickly! I did it with time to spare and LOVE how it turned out. Here's the picture I took right before I started the work, complete with rug from our room waiting to get hosed off (I love Ikea rugs). 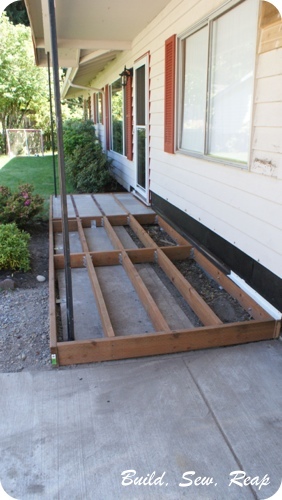 I opted to frame out the joists using pressure treated ground contact rated lumber but the actual porch boards are a composite product we purchases from Dunn Lumber. I'm so thrilled with our decision to use the composite, it's really a beautiful, high quality product. It was easy to work with and while it was much more expensive than natural wood would have been, we won't have to refinish it and don't have to worry about splinters at all. When I started the project, I thought I'd just slap down some joists then screw in the decking and be done. 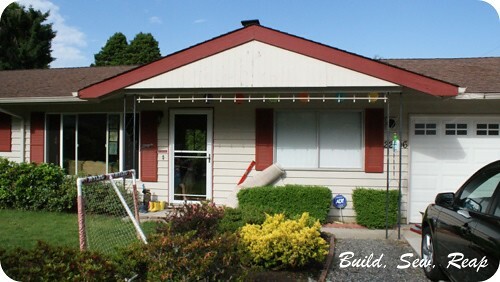 Then I started talking to my neighbor who does things right and he mentioned I should take the bottom strip of siding off and add a ledger board bolted in to the foundation and then a piece of flashing (might not be the right term) to correctly route water away from the house and the project grew. I'm proud to say I did things right, not just fast. I had to do a lot of calculations to route water away from the house because the existing concrete had dropped quite a bit and not in a favorable way. I had to pull out several layers of siding but that gave me the opportunity to refresh the tar paper underneath the new pieces. 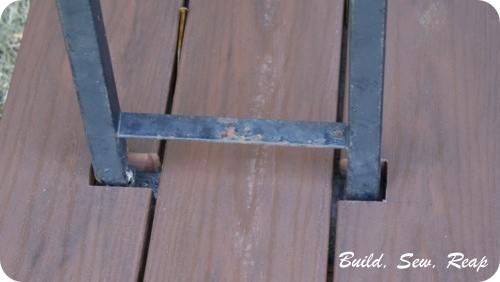 I need to mention here that if you're going to take this as inspiration to do your own porch, this does not meet the clearance requirements set forth by the manufacturer of our composite decking. I don't claim to be a professional but this is sturdy and attractive which were my two primary goals. We're not sure what we're going to do with the posts in the long run but since they might be supporting the front of the house, I didn't want to mess with them. I suspect we'll eventually encase them in wood trim and paint them. For now, I just notched out the decking around them. 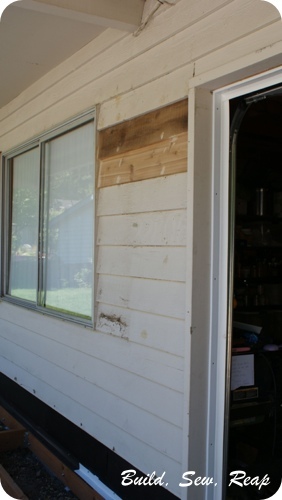 I also decided that while I was updating the front of the house and had to replace some siding, I would fix the huge gaping hole where we used to have our electrical meter. Here are the two boards I replaced but before I painted them and put the shutter back. We've stared at that hole for over 4 years now so it is so fantastic to see a fresh, clean wall. When the front porch project went so well, I realized I had a few days before my parents would arrive so I slapped up some cedar shake, you know, like people do right before they have out of town guests. Oh, and I built a porch swing but you'll have to wait for another post to read all about that. So, are you nuts like me? Do you try to accomplish major tasks before guests visit? Wowee! You are a miracle worker! 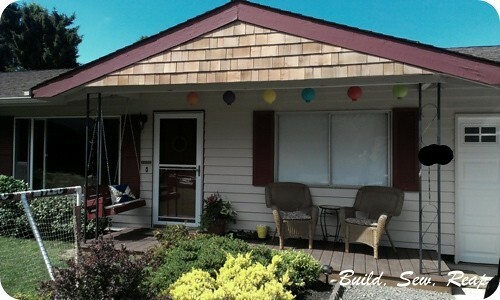 What a difference your work makes to the front of your home! I love it!